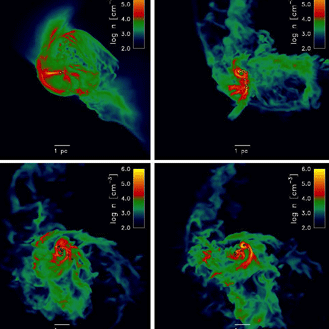 Image shows hydrodynamic instability triggered by rapid cooling in a heavy-element-enriched cosmic dark matter halo when the universe was only 300 million years old. The instability drives turbulence, which breaks the flow into fragments. Some fragments undergo gravitational collapse and splinter into progressively smaller units. From left to right and top to bottom, the six panels show projections of gas density. The horizontal bar has a length of 1 pc = 3.26 light years. Image courtesy Chalence Safranek-Shrader, Milos Milosavljevic, and Volker Bromm. Things were different in the early eons of the universe. The cosmos experienced rapid inflation; electrons and protons floated free; the universe transitioned from complete darkness to light; and enormous stars formed and exploded to start a cascade of events leading to our present-day universe. Working with Chalence Safranek-Shrader and Volker Bromm at The University of Texas at Austin, Milos Milosavljevic recently reported the results of several massive numerical simulations charting the forces of the universe in its first hundreds of millions of years. The simulations ran on the US National Science Foundation-supported Stampede, Lonestar, and Ranger (now retired) systems at the Texas Advanced Computing Center (TACC). The results, described in the Monthly Notices of the Royal Astronomical Society in January 2014, refine how the first galaxies formed, and in particular, how metals in the stellar nurseries influenced the characteristics of the stars. "The universe formed at first with just hydrogen and helium," says Milosavljevic. "But then the very first stars cooked metals and after those stars exploded, the metals were dispersed into ambient space." Eventually, the ejected metals fell back into the gravitational fields of dark matter haloes, where they formed the second generation of stars. However, the first generation of metals ejected from supernovae did not uniformly mix in space. "It's as if you have coffee and cream but you don't stir it, and you don't wait for a long enough time," Milosavljevic explains. "You would drink some cream and coffee, but not coffee with cream. There will be thin sheets of coffee and cream." According to Milosavljevic, subtle effects like these governed the evolution of early galaxies. Some metal-rich stars formed, while others were metal-poor. Generally, stellar chemical abundances varied greatly because of the incomplete mixing. Another evolutionary factor was how the heavier elements emerged from the originating blast. Instead of the neat spherical blast wave researchers presumed before, the ejection of metals from a supernova was most likely a messy process with blobs of shrapnel shooting in every direction. "Modeling these blobs properly is very important for understanding where metals ultimately go," Milosavljevic says. In astronomical terms, early in the universe translates to very far away. Those fugitive first galaxies are unbelievably distant from us, if they haven't already been incorporated into recently formed galaxies. But many believe the early galaxies lie at a distance that will be observable with the James Webb Space Telescope (JWST), set to launch in 2018. This makes Milosavljevic and his team's cosmological simulations especially timely. Telescopes on the ground will perform follow-up studies of the phenomena that the JWST detects - but to do so, scientists need to know how to interpret JWST's observations and develop a protocol for following up with ground-based telescopes. "Should the James Webb Space Telescope integrate the image in one spot for a long time, or should it mosaic its survey to look at a larger area?" Milosavljevic asks. "We want to recommend such strategies for the Space Telescope." His and other cosmological simulations will help determine where the JWST will look, what it will look for, and what to do once a given signal is observed. Distant objects, born at a given moment in cosmic history, have tell-tale signatures - spectra or light curves. Like isotopes in carbon dating, these signatures help astronomers recognize and date phenomenon in deep space. In the absence of any observations, simulations are the best way to predict these light signatures. "We are anticipating observations until they become available in the future," Milosavljevic says. If done correctly, such simulations can mimic the dynamics of the universe over billions of years, and emerge with results that look something like what we see - or hope to see - with new farther-reaching telescopes. "This is a really exciting time for the field of cosmology," astronomer and Nobel Laureate Saul Perlmutter said in his keynote address at the Supercomputing '13 conference in November. "We are now ready to collect, simulate and analyze the next level of precision data... there's more to high-performance computing science than we have yet accomplished." To learn more about the explosion of stars in the earliest galaxies, read Aaron Dubrow's complete piece on TACC's website.